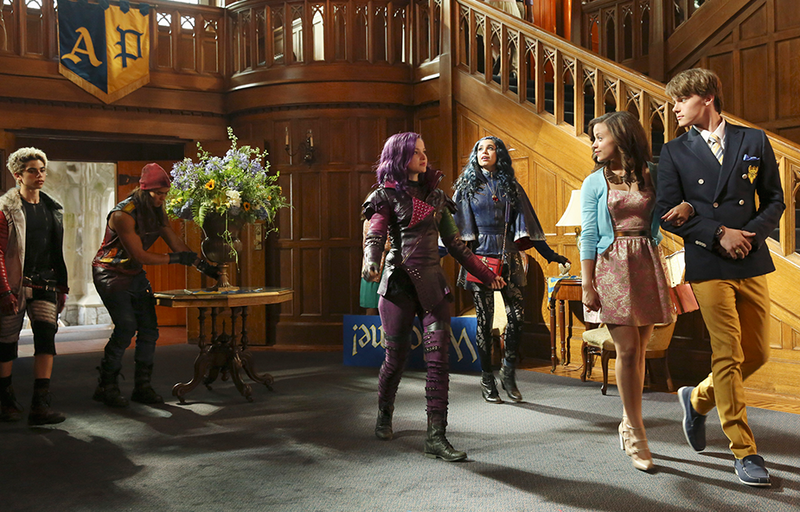 Descendants (television) A Disney Channel Original Movie, debuting on July 31, 2015. The story is set in the idyllic kingdom of Auradon where Ben, the benevolent teenage son of the King and Queen (Beast and Belle from Beauty and the Beast), is poised to take the throne. His first proclamation: offer a chance at redemption to Mal, Evie, Carlos, and Jay, the troublemaking offspring of Maleficent, the Evil Queen, Cruella De Vil, and Jafar, who have been imprisoned on the forbidden Isle of the Lost for 20 years. These villainous descendants are allowed into Auradon for the first time to attend prep school alongside the teenage progeny of Fairy Godmother, Cinderella, Sleeping Beauty, and Mulan. Only time will tell if these evil teens follow in the footsteps of their wicked parents. Stars Dove Cameron (Mal), Cameron Boyce (Carlos), Booboo Stewart (Jay), Sofia Carson (Evie), Mitchell Hope (Ben), Melanie Paxson (Fairy Godmother), Brenna D’Amico (Jane), Kristin Chenoweth (Maleficent), Kathy Najimy (Evil Queen). Directed by Kenny Ortega. A Bad Angels Production.